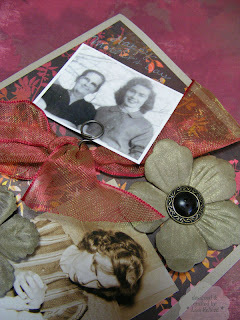 Splitcoaststampers Ways to Use it challenge this week encourages us to use pins of some kind on our project. I just bought these new memo pins from Tim Holtz. 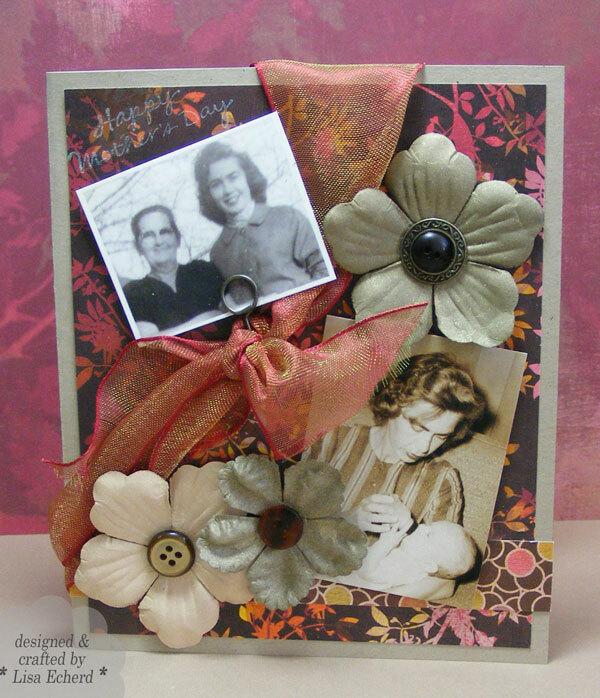 My plan was to do a Mother's Day mini album but the day snuck up on me so I'm using a couple off the photos and one of the pins on this card. I still plan on doing the album. The paper and embellishments are picked out; just need to add a dose of 'time' and it will get done. The paper flowers were sprayed with light gold Tattered Angels spray. It really shows up on these more so than paper. Is it because of their dimension? The ribbon threads through a cut on the side and some glue dots hold in place diagonally across the card. What a beautiful collage and wonderfully personal card for your mom. LOVE the photos, too. Your mother will surely treasure this creation. Perfection!